September 17, 2015 – The latest images from NASA’s New Horizons spacecraft have scientists stunned – not only for their breathtaking views of Pluto’s majestic icy mountains, streams of frozen nitrogen and haunting low-lying hazes, but also for their strangely familiar, arctic look. This new view of Pluto’s crescent — taken by New Horizons’ wide-angle Ralph/Multispectral Visual Imaging Camera (MVIC) on July 14 and downlinked to Earth on Sept. 13 — offers an oblique look across Plutonian landscapes with dramatic backlighting from the sun. 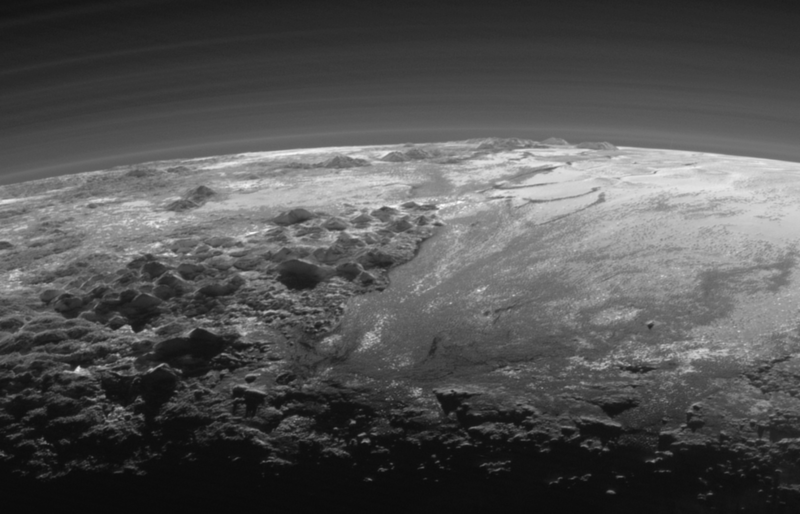 It spectacularly highlights Pluto’s varied terrains and extended atmosphere. The scene measures 780 miles (1,250 kilometers) across. 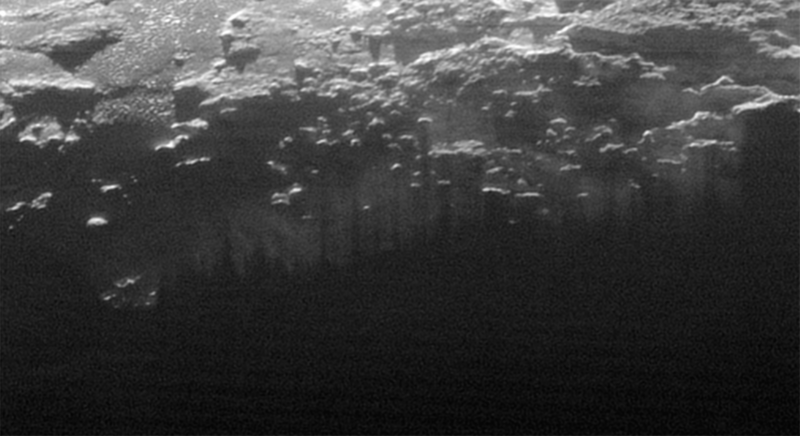 “In addition to being visually stunning, these low-lying hazes hint at the weather changing from day to day on Pluto, just like it does here on Earth,” said Will Grundy, lead of the New Horizons Composition team from Lowell Observatory, Flagstaff, Arizona. 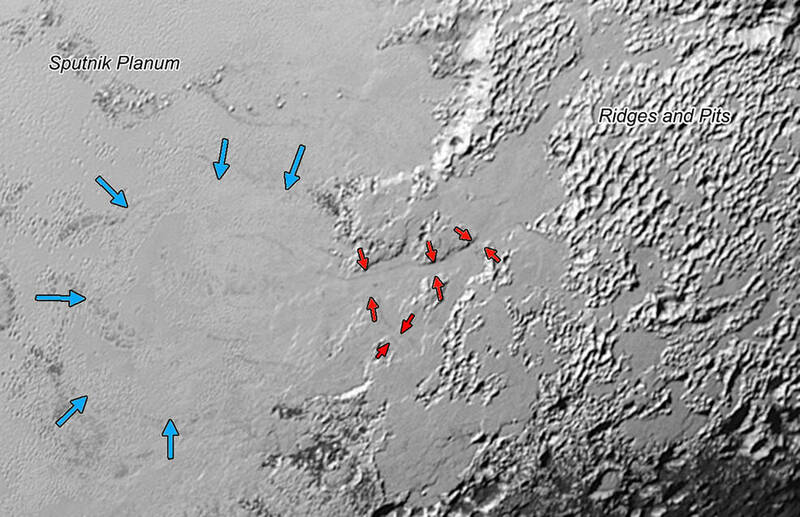 Combined with other recently downloaded pictures, this new image also provides evidence for a remarkably Earth-like “hydrological” cycle on Pluto – but involving soft and exotic ices, including nitrogen, rather than water ice. 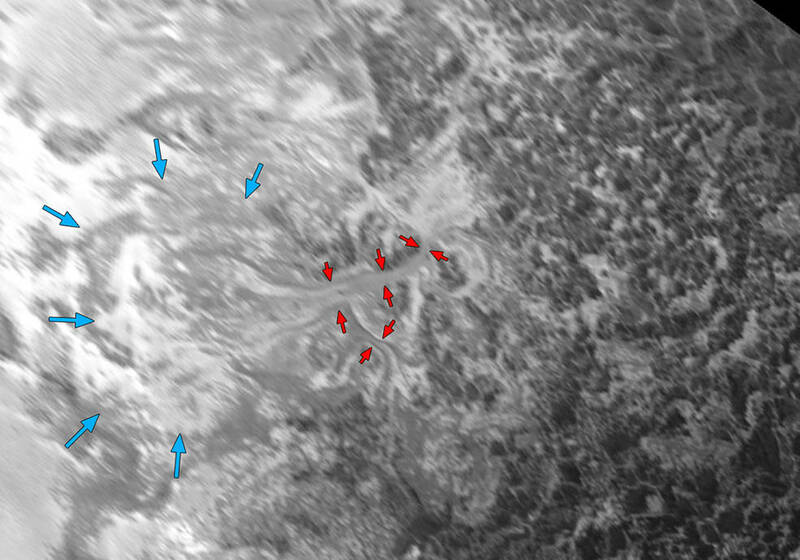 Bright areas east of the vast icy plain informally named Sputnik Planum appear to have been blanketed by these ices, which may have evaporated from the surface of Sputnik and then been redeposited to the east. 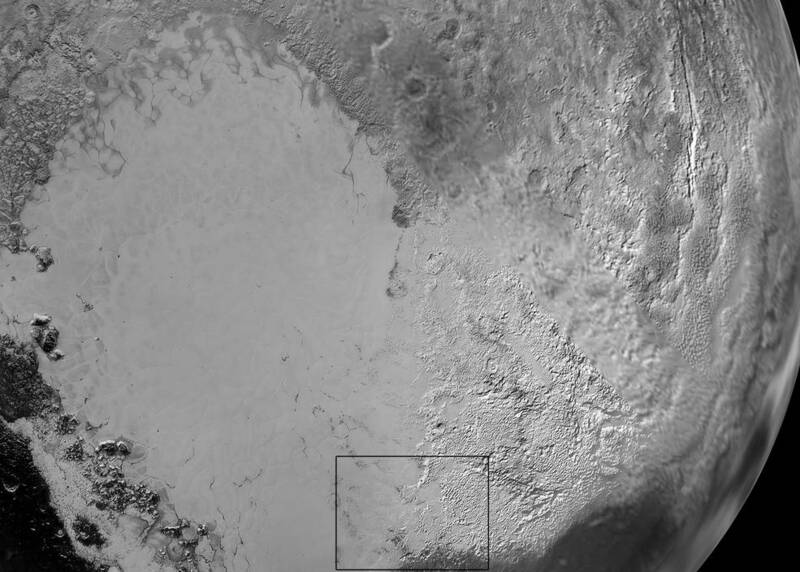 The new Ralph imager panorama also reveals glaciers flowing back into Sputnik Planum from this blanketed region; these features are similar to the frozen streams on the margins of ice caps on Greenland and Antarctica.